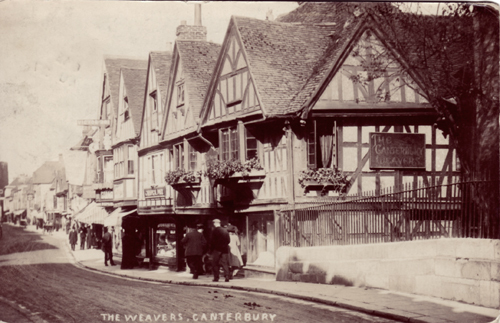 There was said to be approximately 126 master weavers and another 1174 regular weavers in Canterbury, weaving silk, cotton, wool, and making worsted and crewel yarns about the year 1665. 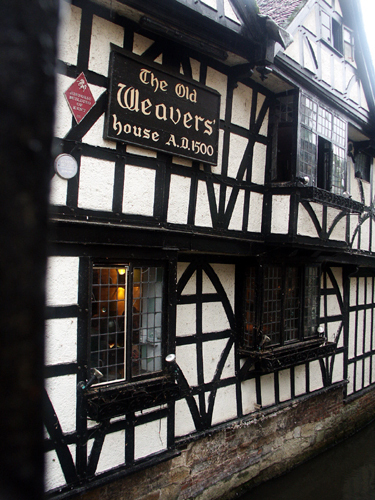 In 1676 the weavers were granted a charter by King Charles II. of which they became a company known as the master, wardens, assistants, and fellowship of weavers. In 1685 King Louis XIV. 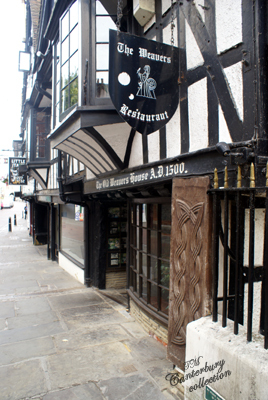 revoked the "Edict of Nance" causing many more families to flee the country and find refuge in Canterbury. John Callaway who was master of the weavers company about the year 1787, introduced a new fabric mix of cotton and silk, which was called Canterbury Muslin. 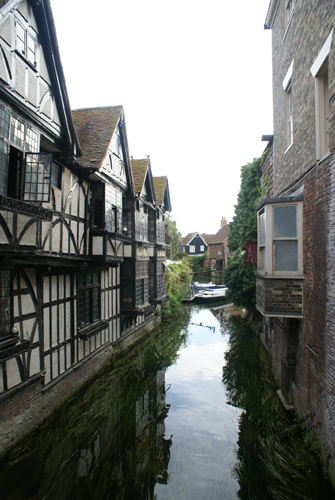 He later erected a cotton mill on the river at Shoal Oak near Canterbury. In the early 1900's Constance Phillpotts* is living at home with her parent's Charles E. Phillpotts a Retired Military Officer, and her mother Jane. The family is living at "The Laurels," on Whitstable road. Constance is a Weaver, as is Miss Edith C. Holmes**, Miss Mabel Holmes is Edith's sister. 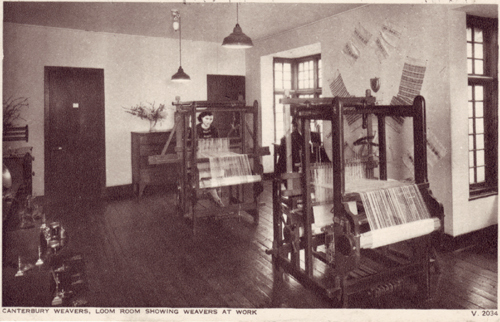 "Since the beginning of the last century till quite recently, the character of the industries had almost entirely changed, and with the exception of a few looms still used for weaving linen, hand weaving had almost entirely disappeared. 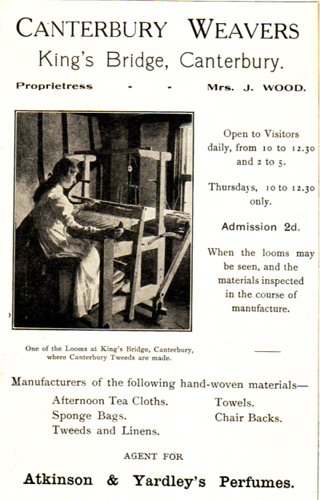 The present revival of this important industry in Canterbury is due to the energy of two ladies, Miss Phillpotts and Miss Holmes, who in 1897 with only 3 looms decided to re-start the once famous manufacture of hand woven fabrics, with a view to giving employment to Canterbury girls and women who from various causes are unable to go into service or leave their homes. The success of their efforts was immediate, and since the year of the Diamond Jubilee the number of looms has been steadily increased to 30. 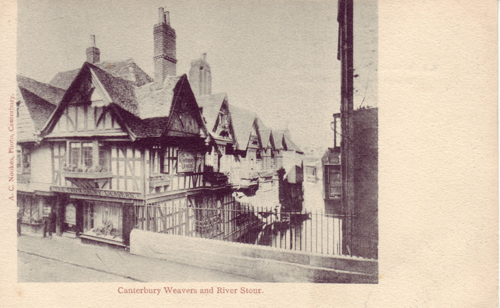 At the present time the Canterbury Weavers own and occupy two of the most picturesque houses in Canterbury, partly chosen on account of their having formerly belonged to the "Strangers" whose bobbins and pieces of raw silk and fragments of old looms were found during the necessary renovations of the buildings. Hand made carpets and rugs, woollen, linen, and silk dress fabrics, etc., are now turned out in ever increasing quantities. The industry which now employs over 30 women and girls at a healthy occupation in cheerful surroundings, is open to the Public Free, from 11 a.m. till 4 p.m."
From Monday, July 22nd, until Saturday, July 27th. F. Bennett Goldney, Esq., F.S.A., Athlone Pursuivant. The Countess of Guildford, The Lady Harris, The Hon. Mrs. Wilfrid James, Mrs. Randal Davidson, Mrs. Walsh, Mrs. Wace, Mrs. Dietz, Mrs Toynbee. Enamels, Basket making, Wood Carving, Weaving, Toy Making, Metal Work, Pottery, Bookbinding, Stenciling, Leather Work, Lace Making, etc. The Exhibitors will include leading representatives of the various Arts and Crafts, who will give practical demonstrations in their craft each day. Allemash-Day (Allumage-Day from Allumer, to light), The day on which the Canterbury silk weavers begin to work by candle light. These manufacturers, then usually called Walloons, on the accession of Queen Elizabeth, and the establishment of the Protestant religion, came in bodies up to London, and having obtained the queen's protection, dispersed and settled in different parts of the kingdom; Those who were weavers in silks and stuffs made choice of Canterbury for their habitation, where they might have the benefit of the river, and an easy communication with London; for which purpose, they had the queen's licence to exercise their trades here, those permitted to settle here not exceeding eighteen housekeepers, besides children and servants; and the queen, as a further mark of her favour, afterwards granted to them the Undercroft of the Cathedral, as a place of worship for them and their successors. These refugees afterwards multiplied so exceedingly that in 1676 their number here was but little short of 2500, and King Charles II. thought proper to grant them a charter, by which they were enabled to become a company, to consist of a master, wardens, assistants, and fellowship of weavers. Not long after this, the Edict of Nantz being revoked in France, by which the Protestants, who had before enjoyed the toleration of their religion, fled in great numbers into different Protestant countries, and it is said 50,000 of them took refuge in Great Britain and Ireland. 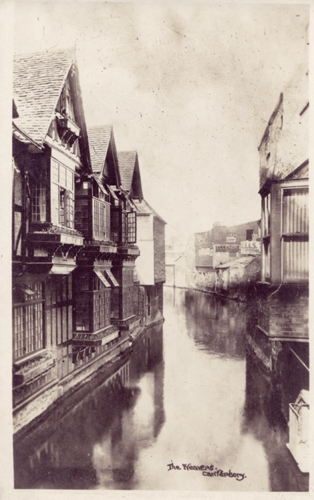 These manufacturers improved to a much higher degree the fabricating of silks of various denominations; great numbers of them came to Canterbury, and joined themselves to the Walloon church, and by their industry the wealth and populousness of the city increased considerably, for the poor, and even their children, found constant employment from these manufacturers, which continued to flourish for a number of years; but of late the silk weaving manufactory here has greatly decayed, the most part of it being removed from hence to Spitalfields, there being now not more than ten master weavers, and about eighty communicants remaining, and only a few looms continued in employment; yet there are numbers of the descendants of these first settlers still remaining, most of whose names have been changed, as far as possible, from the French into the English language, and these have for a long time past intermixed with, and followed the same promiscuous trades and occupations as the other inhabitants; the parishes of St. Alphage and Northgate being in great measure still inhabited by them. These descendants of the Walloons still use the Undercroft of the Cathedral for their place of worship; they have a minister, who is episcopally ordained, but they do not use the liturgy of the church of England. I cannot quit this subject without making mention of that ingenious manufacturer, Mr. John Callaway, the present master of the weavers' company, who, during the unhappy American war, when such was the falling off of the silk trade, that many skillful workmen were so much reduced, as to be forced to apply for relief to the General Workhouse of the city, travelled into the western and northern parts of England, in search of something new for the employment of them, and his ingenuity effected it, for he introduced to the public a new manufacture, which afforded employment and subsistence, not only to those in Canterbury, but in other parts of the kingdom likewise. 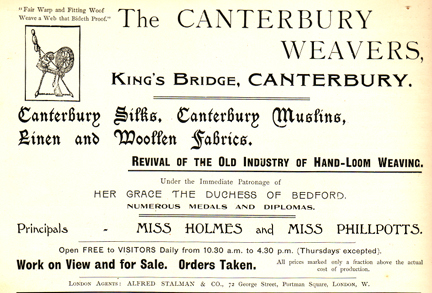 This beautiful new article of fabric was called Canterbury muslin, and the manufacture of it spread so rapidly, that from the time of its invention, which was about the year 1787, it has employed all the weavers in this city, and many hundreds more in London and elsewhere, whence they still retain the name of Canterbury muslins. *In the year 1789 I saw, in Mr. Callaway's silk looms, the richest and most beautiful piece of silk furniture, for the Prince of Wales's palace of Carlton-House, that was ever made in this or probably any other kingdom. Commercial restrictions, however, in conformity with the times, existed in the shape of high duties levied upon their staples. A.D. 1639, there was ordered to be paid to the Silk Office 6d. upon each pound of silk, and 6d. per pound by "foreigners," and 2d. per pound by natives upon all "stuff" manufactured. 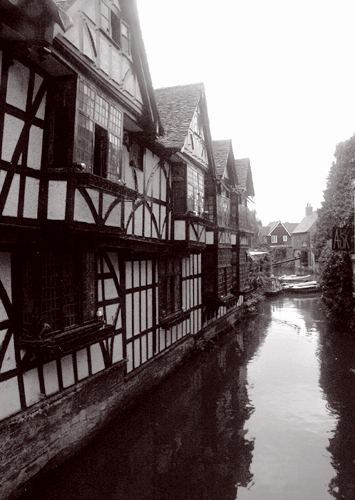 About the year 1665, the numbers of Strangers at Canterbury were said to be 1,300. A.D. 1694, they had 1,000 looms at work, employing 2,700 people. Shortly after this period their trade declined; and A.D. 1719, they were reduced to 334 looms, and 58 master weavers. Many of the artizans had removed to London and elsewhere. 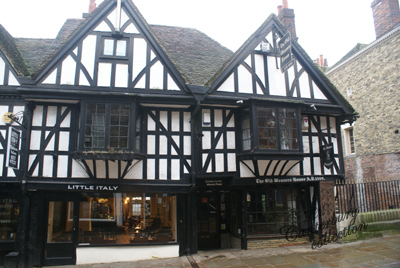 The importation of silks and calicoes from India tended materially to diminish the demand for their fabrics, so that by the close of the last century, there were but ten master weavers in Canterbury, and eighty communicants to their church. "Manufactures.... There are some, however: at Canterbury, silk has been manufactured to a considerable extent; but it is now giving way to cotton. Much credit is due to Mr. Callaway, for his spirited exertions in this branch." 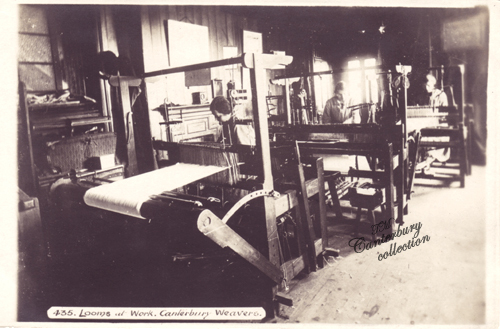 "The principal manufacturers of Canterbury are silk and cotton, particularly of what are called Canterbury muslins. This species of goods was first invented about the year 1787, and was rapidly diffused to other parts of the kingdom. Very fine silks have been manufactured here; but this manufacture, as well as that of cotton, has declined." 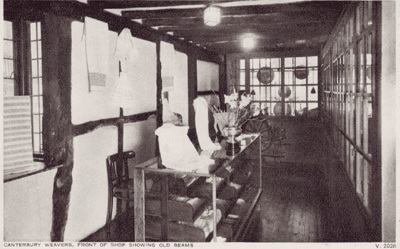 The manufacture of silk, established by the Walloons under the auspices of Queen Elizabeth, and which had flourished in such a degree as to obtain from Charles I. a charter of incorporation, gave place in 1789 to the introduction of the cotton-manufacture by Mr. John Callaway, master of the company of weavers, who discovered a method of interweaving silk with cotton in a fabric still known by the name of Canterbury, or Chamberry, muslin; what now remains of the silk manufacture, employing but a few persons, is conducted by his grandson. A considerable trade in long wool is carried on, and there is an extensive manufactory for parchment...."
.... The population is 12,745. There is a little silk weaving carried on in town; but its principal trade is in the hop plantations of its neighbourhood. The undercroft of the cathedral was given to the Walloons by Elizabeth, in 1568, who established the art of silk weaving; little, however, remains now of this manufacture, but the weaving of damask table linen, has lately arisen and attained to great perfection. Towards the latter end of the 18th century, the silk weaving manufactory here had greatly decayed, the most part of it being removed to Spitalfields, there being in 1799 not more than 10 master weavers, and only about eighty communicants. (Hasted) The following memoranda have been collected relative to this congregation. 1582 - The Burghmote direct that no more strangers shall be suffered to live in the city, unless allowed by the Mayor and three Aldermen under their hands and seals. 1642 - The Walloons are to have two seals, to seal their two sorts of sayes. 1657 - Seven hundred and thirty-nine poor persons employed as woolcombers. 1687 - The weavers have their Hall at the Blackfriars in this city. In a copy of a petition to the Lords of Trade and Plantations, and now in the City Chamber, it is stated, that the trade of the strangers is weaving all sorts of silk, and silk mixed with wool; that in 1694 they had 1000 looms at work in this city, employing above 2700 people, but shortly afterwards their looms were reduced to 200 by the importation of East India silks and calicos; that in 1719 there were only 334 looms in use in the city, and 58 master weavers living there, who had 51 apprentices, and that no journeymen were allowed to take apprentices, but were paid by the piece, according to the richness of the work. "Our congregation doe bare armes in the traine bands for his Majesties service to the number of fifty men and upwards. 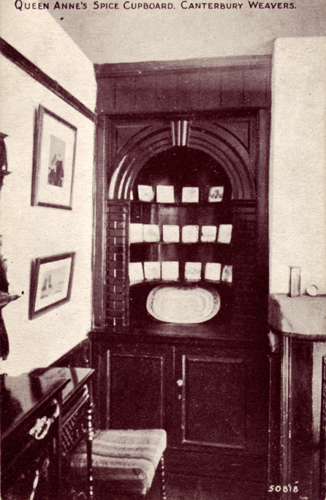 We have from time to time shewed our affection and readiness to advance his cause in the rising in Kent, where divers of us have ventured their lives and estates for the King's service to his Majesty, first, in the gift presented unto him at his coming into England; also in the poule money, and more largely in the act of benevolence." 1. That there shall be still (as there hath been since the erection of the Silk Office) six pence paid at the said office upon every pound of silk, both by natives and strangers; and six pence more paid by strangers, and two pence by natives upon all stuffe manufactured. 2. That all stuff made at Canterbury shall be searched and sealed there, and not brought to the Hall at London to be sealed. 3. That all deceitful stuff made either by natives or strangers, be forfeited, defaced, and destroyed. 4. A bond in £100, penalty for securing His Majesty's duty. That the weavers of London and Canterbury be severed by several letters patent, the one from the other. 26th April, 1631. Letter from the Privy Council to Lord Maidstone, the Mayor and Recorder of Canterbury, &c. to assist the congregation in enforcing their rules, for the good government of the trade and congregation. 1651 - A bond (penes me,) from Abm Landing of Sturry, Fuller, to the Overseers appointed in the Old Hall of Weavers, that whosoever brings any Sayes to full and thick, he will full and thick them conveniently, wand without neglect, and receive no piece fore it has been measured at the Hall. 1641 - By reason of the war in Picardy, Artois, and Flanders, many other Walloons are resorting to this city, and more are daily expected; it is agreed that if they do conform to the government of the city and the orders of the congregation, they may live as they have done for sixty years and upwards; it being found that by their trade they have been beneficial to the city. And a book is to be provided, in which their names shall be entered with their testimonials. 28th August 1661. The King's letter requiring the Church not to admit or use Mr. Stoupe as minister, but give him to understand he is not to return to this kingdom, he being a known agent, and a common intelligencer of the late usurpers. 1663 - Assizes were holden in this year before Sir Orlando Bridgman and Sir Samuel Browne, Knt two of the King's Justices, at the request of the inhabitants of Canterbury, to try a question between the Citizens and the Walloons, who deny contributing to the assessments for the relief of the English poor of the city. 1. That all divisions occasioned by the late seperation be for ever forgotten. 2. That both parties shall unite in one entire congregation. 3. That they immediately proceed to a choice of a minister, who is to be presented to the general colloque for approbation. 4. Nothing to be done or spoken to the contempt of the liturgy, doctrine, or discipline of the Church of England. 5. Thay they maintain their own poor. 1. That the usual place of meeting near the Cathedral be continued as formerly. 2. That for avoiding the penalities of nonconfirmity, this congregation be declared a part of the foreign reformed churches. 4. That they be not taxed for any poor but their own. In Mr. Turner's expressions before the judge at the assize at Maidstone, 1st August 1679, it is stated that the congregation did contain 2500 communicants. "That the strangers at their first coming in Queen Elizabeth's raign,e they were then poore and distressed strangers, but now they are grown goger and moger." Several pieces of land in Burmash in Kent, given in 1675, surviving Trustees, Peter Delasaux, I. Hulber, Lewis Decaufour - annual produce £46 0s. 0d. A Rent Charge on an Estate at Ickham, to purchase wood fuel for the poor Wallons, by Will of ABm Didier in 1668 - annual produce £1 0s. 0d. Legacies, collections, contributions, &c., by the members of the French congregation, to form a revenue for the minister and poor (from 1570 to 1786) £1200 Old South Sea Annuities; Trustees, Peter Delaseaux, James Six, I. Legrand, John Claris - annual produce £36 0s. 0d. 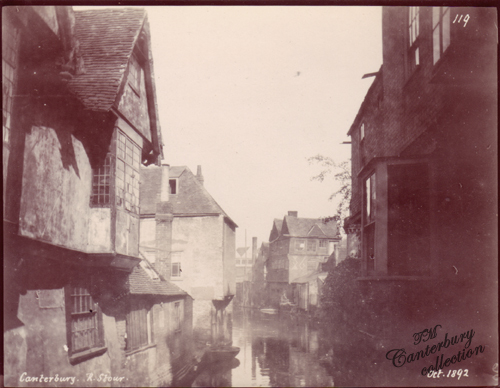 The ancestor of The Bouveries, who now possess the Earldom of Radnor, was a native of the Low Countries. When a mere youth he fled from his native country to avoid the fangs of the Inquisition. Wandering into Frankfort, he sat down weary and depressed at the gate of a lofty mansion. The master chancing to come up interrogated him. The ingenuous lad related his simple history, and was taken into the service of the German merchant prince. After the death of his patron, young Bouverie took advantage of Queen Elizabeth's liberal encouragement of foreign Protestants. 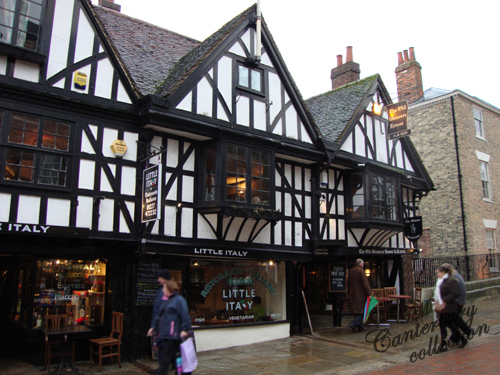 He emigrated from Frankfort to Canterbury, where he carried on his silk weaving, and found freedom to worship God in the chapel assigned to foreigners, and still occupied by them within the cathedral. The second Bouverie in succession from the Canterbury immigrant was knighted; the third was created a baronet and the fifth was raised to the peerage. The silk trade of England, employing upwards of half a million of people, is the exclusive occupation of only two localities in that country of any great importance - Spitalfields and Macclesfield. In the latter place, where it employs about 25,000 persons, it is entirely the growth of the last sixty years; in Spitalfields it boasts of a much higher antiquity, dating its origin as far back as 1685. Silk weaving was not entirely unknown in England prior to that time, it having been carried on at Canterbury, Norwich, and other places, by large numbers of refugees from religious persecution on the continent. A new impulse was given to the trade in 1685, caused by the revocation of the Edict of Nantes, when upwards of 50,000 French refugees, chiefly weavers, found an asylum in this country, and were treated with the utmost consideration, both by the parliament and people. A grant of £15,000 pounds per annum was voted by government for their immediate necessities, and they were permitted to settle on what was then an open space belonging to the Hospital of St. Augustine, and known as "Hospital-fields:" hence, by a very obvious abbreviation, the modern name Spitalfields. The hospitality thus afforded, appears to have been in no way abused, for the liberality of the legislature soon became unnecessary, the weavers attaining a flourishing and important position; so much so, that in less than thirty years afterwards, their trade in its various branches maintained upwards of 300,000 persons in England, about half the number at present engaged in it. While the cotton trade has originated and grown to its present colossal dimensions almost within the memory of the present generation, 140 years has scarcely sufficed to double the number of those dependent on the silk trade. The early growth of the silk trade was, however, of a far more extraordinary character than that of the cotton trade, the first forty or fifty years having witnessed its development to an extent, which, when taken in connexion with the total population of the country, is entirely without a parallel. For many years the population of Spitalfields was almost exclusively French, and although in a foreign country, they retained almost to within the memory of persons now living the use of their native language, remnants of which may still be traced in names of articles used by the weavers. For instance, the instrument used to turn the work on to the beam after it is woven is called a tanto; in Norwich, where the Flemings are supposed to have given most of the names to weavers' tools, the same thing is called a starking pin. The batteau, the battens, the mounture of the Spitalfields weaver, are substitutes for the rol, the boards, and the harness, of the Norwich weaver; the former words being pure French, and the latter evidently of Saxon or low German origin. Lancashire has synonymes for these words in rathe, lathe, and mountain, the latter clearly a corruption or mispronunciation of the French name. The evidence of French antecedents is not, in Spitalfields, confined to the names of tools; numbers of proper names of undoubted French parentage are to be found scattered over the whole district, many of them owned by shopkeeper's and small tradesmen. The foreign aspect of the neighbourhood is, however, with the exception of a few names, almost entirely amongst the things that were. 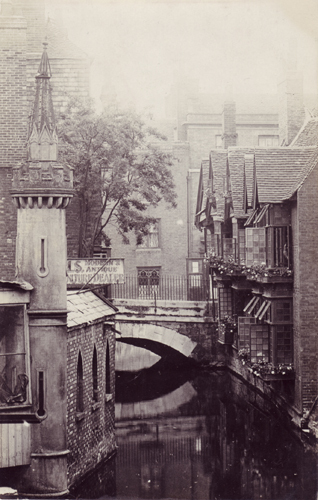 The French songs, which we are told were formerly sung about the streets, the French coffee houses, the French manners, the dash of French in the style of houses, the porticoes, the seats at the doors, with the weavers on summer evenings enjoying their pipes, all these are gone, leaving scarcely a remnant behind. Spitalfields is changed; and, it is painful to add, not for the better. Silk manufacturers discovered this, and as Spitalfields has declined, other places have taken its trade. The silk trade, which, at its commencement, was almost confined to one locality, is now scattered over twenty counties. In the small towns of Essex, in Kent, in Somersetshire, in Norfolk, in Lancashire and Cheshire, in Derbyshire and Staffordshire, in Northamptonshire, Leiecestershire, and Warwickshire, and even in Yorkshire, the sound of the silk loom may be heard. I many of these places the trade is extending, but Spitalfields declines. Although the original cause of this decline was the high wages demanded, the reaction has been so great that prices are now lower in Spitalfields than in some of these places to which the trade has fled. Forty years ago, the best hands earned as much as £7 or £8 per week; and they would any of them have been ashamed of themselves not to have kept St. Monday as a holiday. There was no waiting then; one week's wages was the average wages of the year, and the masters were so anxious to obtain the goods, that some of them have been known to take work in from weavers on a Sunday morning. If by some strange chance, a man played a week instead of working, he went to the warehouse for his wages on Saturday as usual. There were no "black" Saturdays then, no empty cupboards because the "cane was down." The weavers of those days were amongst the most respectable of tradesmen, and in Norwich, to this day, the old women will often tell of the time, when a farmer's daughter was said to have made a "capital match" by marrying a weaver; now the milk maid and scullery girl turn up their noses with supreme contempt at the idea of such a suitor. For upwards of a hundred years the weavers of Spitalfields maintained almost a monopoly of the silk weaving trade, but at the commencement of the present century it became evident that its glory was departing. The work was sent elsewhere, and all their committees and combinations and strikes were found to be unavailing. They have no list of prices now, no committees, no combination, no strikes; prices are so low that they are not worth the cost of a hopeless contention with the masters. The steed has been stolen, and it is useless now to lock the stable door.